Camille Perri, author of the delightful new romantic comedy novel When Katie met Cassidy answered a few questions about New York, new love, and more. So much loving detail is given to clothing in this novel – can you tell me a little about how you present your main characters? I like clothes. I like fashion; particularly men’s fashion. Both my father and my grandmother on my mother’s side were tailors, so I think it’s in my blood. In terms of fiction writing, clothing serves as an efficient and fun method of characterization. You can not know a single thing about someone—a stranger who steps into a restaurant, let’s say—but their clothing tells you so much about them before they even open up their mouths to speak. Clothing reveals what a character is trying to project, as well as what they’re giving away about themselves without even realizing it: their socioeconomic class; their confidence level; their vulnerabilities. For Cassidy, the clothing she chooses to wear is of utmost importance because it functions as a reflection of her gender identity. Everything she puts on has been curated. Her clothes are her armor. Katie, on the other hand, is always deliberating about what to wear. Depending on where she’s going and which version of herself she wants to accentuate, her clothing varies greatly. I think of Katie’s many costume changes as a reflection of the way she’s still trying on different versions of herself in this novel. She’s still searching for what feels right, which version of herself is the most authentic. This book is such a joyful, fun depiction of two women falling in love – that’s still pretty rare. Are there any books or movies with romantic relationships that meant a lot to you? My favorite lesbian romance of all time is the 1999 movie But I’m a Cheerleader, starring Natasha Lyonne and Clea DuVall. RuPaul is also in it, so is the brilliant Melanie Lynskey. It’s a satirical comedy about a cheerleader who is sent to conversion therapy camp to cure her lesbianism. It’s one of the smartest, funniest movies I’ve ever seen. The magic of this film is that it’s so much fun to watch as it tackles the complexity of hetero-normativity and the social construction of gender. Do you have a favorite romantic comedy? Everything Nora Ephron. My novel isn’t called When Katie Met Cassidy for nothing! But shh…my favorite Nora Ephron rom-com isn’t When Harry Met Sally—it’s You’ve Got Mail. What I love about all of Ephron’s romantic comedies though is the way they’re more than just love stories. They also function as reflections of something specific going on in American culture at the time they were made. YGM, for example, is more than a simple feel-good story about two people in an online romance who are unaware that they’re business rivals. It’s also about how romance was changing with advances in technology, and how chains of mega bookstores were putting beloved independent shops out of business at alarming rates. I guess I like a little bit of social commentary with my romantic comedies. And nobody did that better than Nora Ephron. Katie grew up pretty sheltered and has always thought of herself as straight. Why did you want someone new to dating women as one of your protagonists? I liked the idea of someone who has never before been romantically attracted to a woman, and who’s never considered herself anything but straight and “normal,” to suddenly have to rethink her assumptions. Most of us who identify as LGBTQ at one time thought of ourselves as straight, too. That process of opening oneself up to a different path is very interesting to me and ripe for good storytelling. 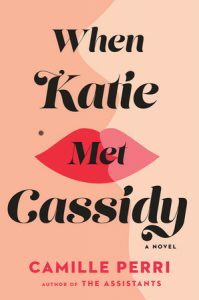 Part of the issue for Katie, too, goes beyond her surprise at her attraction to Cassidy; it’s also that Katie is someone who very much needs to be liked. She yearns to be approved of. It’s difficult for her to risk upsetting her parents, or to accept that if she’s out with Cassidy, some people will look at her differently, in a way that may not be as approving as she’s accustomed to. That’s what I wanted to write about because part of coming to terms with being read as gay is adjusting to the fact that there will be some people out there who aren’t going to like you, no matter how hard you try, solely because of this one aspect of your personhood. You previously worked as a books editor for Cosmopolitan and Esquire – what would surprise the average reader to know about that kind of job? I think the average reader would be surprised by how many Readers with a capital “R” and book lovers work at those magazines. The people behind even the glossiest of magazines are, for the most part, smart and socially aware and many of them are doing their best to provide a service—a social good—even as they’re under a tremendous amount of pressure to put out a product that remains popular and profitable. What novels have you especially loved lately? I’ve enjoyed the recent hardcover releases The Wife by Alafair Burke; Sunburn by Laura Lippman; The Favorite Sister by Jessica Knoll, and in paperback, Julie Buntin’s Marlena. You obviously have a lot of love for New York – are there any bars or restaurants that feel like home? I’m big on coffee shops. Fortunately I live in Brooklyn where there are many to choose from. When I lived in Williamsburg, I basically lived in a coffee/pie shop called The Blue Stove. That’s were I wrote most of my first novel, The Assistants. I’ve since moved to the Brooklyn Heights/Downtown Brooklyn area and have set up shop at a wonderful café called Swallow in Cobble Hill. It only took a few months for most of the staff to know me by name. I leave them no choice!